Sebastian Junger is the internationally acclaimed, best-selling author of The Perfect Storm, A Death in Belmont and Fire. As a contributing editor to Vanity Fair and as a contributor to ABC News, he has covered major international news stories in Liberia, Sierra Leone and other places around the globe. He has been awarded the National Magazine Award and an SAIS Novartis Prize for Journalism. 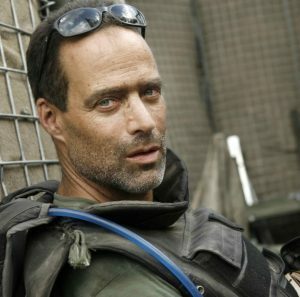 Junger became a fixture in the national media when, as a first-time author, he commanded The New York Times best-seller list for more than three years with The Perfect Storm, which later set sales records and became a major motion picture from Warner Bros. For over a year, Junger and photojournalist Tim Hetherington embedded with battle company of the 173rd Airborne Brigade Combat Team, in the remote and heavily contested Korengal valley of eastern Afghanistan. Reporting on the war from the soldiers’ perspective, Junger spent weeks at a time at a remote outpost that saw more combat than almost anywhere else in the entire country. The professional result is twofold: an upcoming book titled WAR (Twelve, May 2010), and a 96-minute documentary Restrepo that won the 2010 Grand Jury Prize at the Sundance Film Festival and will air on the National Geographic Channel and in theatrical release. His reporting on Afghanistan in 2000, profiling Northern Alliance leader Ahmed Shah Massoud, became the subject of the National Geographic documentary Into the Forbidden Zone. In 2001, his expertise and experience reporting in Afghanistan led him to cover the war as a special correspondent for ABC News and Vanity Fair. His work has also been published in Harper’s, the New York Times Magazine, National Geographic Adventure, Outside, and Men’s Journal. He has reported on the LURD besiegement of Monrovia in Liberia, human rights abuses in Sierra Leone, war crimes in Kosovo, the peacekeeping mission in Cyprus, wildfire in the American West, guerilla war in Afghanistan, and hostage-taking in Kashmir. He has worked as a freelance radio correspondent during the war in Bosnia. Junger is a native New Englander and a graduate of Wesleyan University. Junger lives in New York City and on Cape Cod.